Owners Linda and John Meig’s commitment to the preservation of this historic structure and the creation of its ArtLoft Gallery in 1998 entered a second stage nearly a decade later with the advent of the Connor Meigs Art Award which includes a month long solo exhibition, a $1,000 honorarium, and resources to help a young artist launch their art career. This award honors the title figure who died at age 19 on Christmas Eve, 2004 from injuries sustained in a car accident. Connor had been an art student at the University of Kansas in Lawrence and promised a solo exhibit at the ArtLoft Gallery upon his graduation. Not being able to receive this gift, Connor’s parents created this award in living memory to his artistic talent. The work of the 2011 recipient, Woohynun Shim, is currently on display at the mill in the exhibit, The Story Starts Where It Ends…& Ends Where It Begins. Woohyun Shim, a 2010 graduate of the School of the Art Institute of Chicago, is working toward her M.F.A. at the University of Pennsylvania, As the 2011 Award Recipient, Shim brings to the ArtLoft exuberant drawings and paintings filled with active color and brushwork. Ephemeral change is the exhibition’s theme in work that fuses Eastern Buddhist philosophy with Western action painting. “The very basic Buddhist principle is ‘everything is changing’” Shim writes in her Artist Statement. The partial Buddhist figure at the composition’s edge in The Golden Mountain appears to simultaneously advance and recede in space. Architectural elements, smaller figures, and animals abound in this collage and mixed media on paper. The image transforms itself between abstraction and representation, depending on how one chooses to see it. Marshmallow Tornado, Blue Storm, and Lung For a Toad are rich with color, multi-layering, and repetition. The titles add another layer of ambiguity, enhancing the sense of wonder. Scale and pattern collide with one another. These images contain a sense of sheer joy in the apprehension of visual stimuli. Something Reminds me of Mok-Dong Street, Magpie Bridge, and Hard to Find 3 Chickens are more surreal with deliberate story references. They are larger works on paper utilizing collage, painting, and drawing. They seem like large sketches, allowing the viewer a glimpse into the step by step process of compositional problem solving. “Recently, I discovered a new method to convey my artistic ideas, which is creating stories. In many Korean folk tales, the idea of transformation is deeply rooted, influenced by Buddhism” writes Shim. Studying these larger pieces sets the stage for the satisfaction of seeing Where The Bad Things Are. 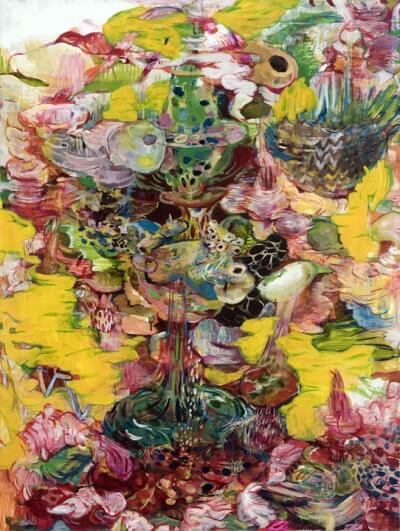 The intensity of color and fusion of pattern are just two of many aspects to enjoy in this fully realized oil painting on canvas. Sometimes I Wonder How I Have Flown Like She Wonders How She Has Walked is more challenging in its presentation of possible interpretation. There are silly, as well as sublime passages. The visual conundrum of this canvas invites the viewer to ask lots of questions. Active brush work and speed of execution make this a celebration of process. These paintings are performers making transformations in present time. Seeing the 19 works in this exhibition is a rare opportunity to experience a body of work by a bright, talented artist at the beginning of a promising career.